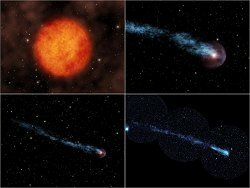 August 15, 2007: Astronomers using a NASA space telescope, the Galaxy Evolution Explorer, have spotted an amazingly long comet-like tail behind a star streaking through space. The star, named Mira after the Latin word for "wonderful," has been a favorite of astronomers for about 400 years, yet this is the first time the tail has been seen. Galaxy Evolution Explorer--"GALEX" for short--scanned the popular star during its ongoing survey of the entire sky in ultraviolet light. Astronomers then noticed what looked like a comet with a gargantuan tail. In fact, material blowing off Mira is forming a wake 13 light-years long, or about 20,000 times the average distance of Pluto from the sun. Nothing like this has ever been seen before around a star. "I was shocked when I first saw this completely unexpected, humongous tail trailing behind a well-known star," says Christopher Martin of the California Institute of Technology. "It was amazing how Mira's tail echoed on vast, interstellar scales the familiar phenomena of a jet's contrail or a speedboat's turbulent wake." Martin is the principal investigator for the Galaxy Evolution Explorer, and lead author of a Nature paper appearing today to announce the discovery. Astronomers say Mira's tail offers a unique opportunity to study how stars like our sun die and ultimately seed new solar systems. Mira is an older star called a red giant that is losing massive amounts of surface material. As Mira hurtles along, its tail sheds carbon, oxygen and other important elements needed for new stars, planets and possibly even life to form. This tail material, visible now for the first time, has been released over the past 30,000 years. "This is an utterly new phenomenon to us, and we are still in the process of understanding the physics involved," says co-author Mark Seibert of the Observatories of the Carnegie Institution of Washington in Pasadena. "We hope to be able to read Mira's tail like a ticker tape to learn about the star's life." Billions of years ago, Mira was similar to our sun. Over time, it began to swell into what's called a variable red giant - a pulsating, puffed-up star that periodically grows bright enough to see with the naked eye. Mira will eventually eject all of its remaining gas into space, forming a colorful shell called a planetary nebula. The nebula will fade with time, leaving only the burnt-out core of the original star, which will then be called a white dwarf. Compared to other red giants, Mira is traveling unusually fast, possibly due to gravitational boosts from other passing stars over time. It now plows along at 130 kilometers per second, or 291,000 miles per hour. Racing along with Mira is a small, distant companion thought to be a white dwarf. The pair, also known as Mira A (the red giant) and Mira B (the white dwarf), orbit slowly around each other as they travel together through the constellation Cetus 350 light-years from Earth. In addition to Mira's tail, GALEX also discovered a bow shock, a type of buildup of hot gas, in front of the star, and two sinuous streams of material coming out of the star's front and back. Astronomers think hot gas in the bow shock is heating up the gas blowing off the star, causing it to fluoresce with ultraviolet light. This glowing material then swirls around behind the star, creating a turbulent, tail-like wake. The process is similar to a speeding boat leaving a choppy wake, or a steam train producing a trail of smoke. The fact that Mira's tail only glows with ultraviolet light might explain why other telescopes have missed it. GALEX is very sensitive to ultraviolet light and also has an extremely wide field of view, allowing it to scan the sky for unusual ultraviolet activity. "It's amazing to discover such a startlingly large and important feature of an object that has been known and studied for over 400 years," says James D. Neill of Caltech. "This is exactly the kind of surprise that comes from a survey mission like the Galaxy Evolution Explorer." Caltech leads the Galaxy Evolution Explorer mission and is responsible for science operations and data analysis. NASA's Jet Propulsion Laboratory, also in Pasadena, manages the mission and built the science instrument. Caltech manages JPL for NASA. The mission was developed under NASA's Explorers Program managed by NASA's Goddard Space Flight Center, Greenbelt, Md. Researchers sponsored by Yonsei University in South Korea and the Centre National d'Etudes Spatiales (CNES) in France collaborated on this mission.